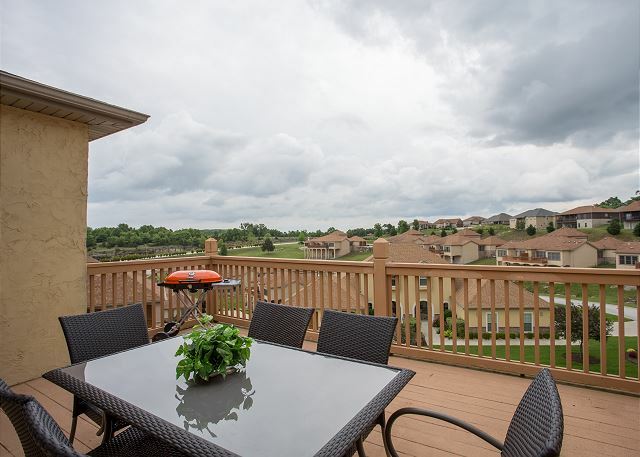 Enjoy all the posh luxuries you deserve from your vacation when you rent Villa Vista, this beautiful 4 bedroom villa at Branson Creek! Fall right into the lap of luxury when you open the doors to this enchanting vacation rental. 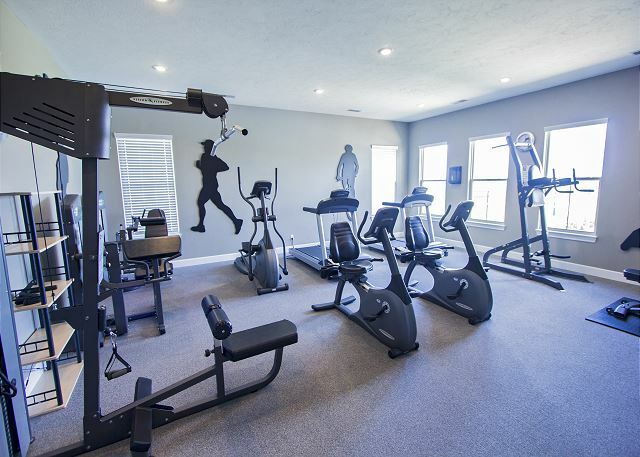 Plenty of space, beautiful decor, and top-of-the-line amenities make this the perfect destination for your dream getaway! Dish out a quick snack with the full-sized kitchen at your disposal, or just sit back and catch up on your favorite shows on the flat-screen television eloquently placed above the fireplace. It's the perfect place to sit down with your loved ones and plan all the fun you're going to have in Branson! And when the day's adventure ends, make sure to take a moment to breathe out on the private deck and let the night roll by as you share memories that will last a life-time. Memories are easy to make in Branson! From the dazzling Branson Strip to glorious Tablerock Lake, you can find a million things to do that everyone will love. Live-entertainment, top-notch restaurants, unique shopping experiences, and amazing outdoor activities make Branson an amazing vacation destination. 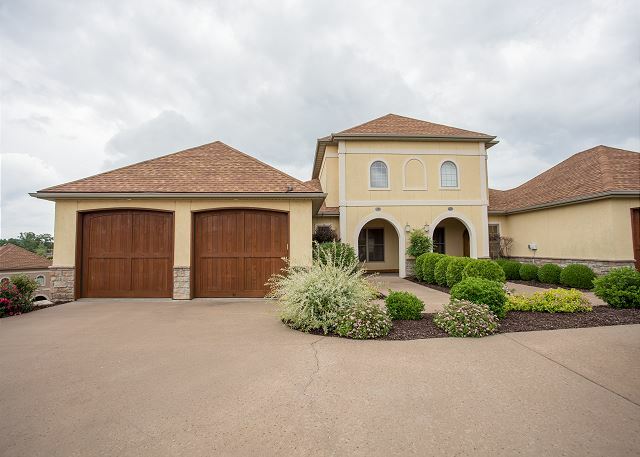 And when you're ready to head back home, don't worry about starting early: this villa is a short drive to Branson Airport, where you can fly home in comfort and relaxation! And of course, that just makes it easier to fly right back and spend more time in the beautiful Ozarks! We appreciate you great feedback, Benjamin! Thank you so much for the review, and we hope to see you again very soon! The home was very nice. We asked for a four bedroom and we actually had two bedrooms and a loft. We also had to make q run to the store to get toilet paper. There was s half roll for 3 bathrooms and 10 people. We are really happy to hear that you enjoyed your stay at Villa Vista, Alisha. Regarding the toilet paper, we always try to have one roll hanging and another underneath the sink for each bathroom. After that, it is entirely up to the guest to purchase any additional toilet paper. However, it is entirely possible we made a mistake and did not provide enough before your stay! In that case, you can contact us 24 hours a day with any issues or questions. We always have someone answering the phones! Thank you again for your feedback, and we hope you'll stay with us again on your next Branson vacation. Nicely decorated and furnished villa with plenty of room for my family. Close to downtown Branson. Met all our needs and was very comfortable. Nice, Clean Home and Great Location! This house was very nice. The pools and workout facility were great. The pools were a bit on the small side, but very clean and never crowded. The one downside to this home, is that upstairs bedroom area is loft style, so it opens down to the living area and kitchen. It made it tough to get the kids to bed, if the adults wanted to stay up longer. The front bedroom also was open to the stairway, which made it noisier and less private than a closed off room. Good open space, clean and quiet, peaceful location. The house was clean and in a nice neighborhood. The sleep space could be improved if sleeping 10 people with the last 4 having to use a futon and pullout sofa. Could easily have the sleep space improved with bunk beds and a twin/trundle bed to reace the futon and sleeper sofa. Kitchen stocked with dishware, bakeware and utensils. Could use more pantry items like basic seasonings, cooking spray, more paper towels, napkins and trash afs. With 10 people, supplies they stock don’t last. Had plenty of blankets and pillows but lacked enough extra sheets and pillow cases.The front door locks automarically when it closes which makes people leave the door open too long for loading/unloading and In return the house had a lot of flies when we arrived. We had to go buy a fly swatted. It would be better if the front door lock had a 15 minute delay before loacking. I stayed in this rental with 9 other family member and we were all impressed with the condition of this rental. 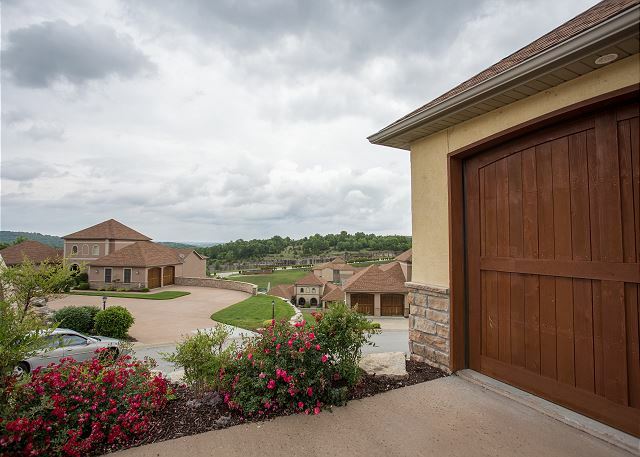 The location is a 10 minute drive at most from the main strip in Branson. There were plenty of extra blankets, towels, dinnerware. For our big group there was only enough towels and dinnerware for each of us but no complaints because there were laundry detergent and dishwasher pods provided. The deck had been replaced and had an awning and table and chairs. Only recommendation is for Management to provide code to garage door. 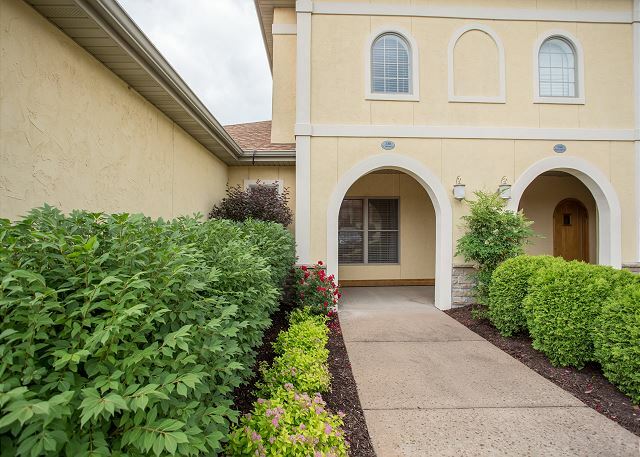 Great stay in pleasant and well kept condo. Near Buffalo Ridge Golf and Mt Top. The accommodations were great. Perfect for our group and the property was as advertised. Only complaint was the quality of the toilet paper. John Wayne took more **** off people. Absolutely loved our stay, such an accommodating property. Would stay here again in a heartbeat! Hello, Jason. Thanks for leaving us your review. We hope to see you again soon, don't forget to mention your previous stay for a special returning guest discount! Perfect for 2 couples with a couple of children. Clean, comfortable, convenient, and darn right nice. Coffee maker doesn't use what I think are standard filters, owner should consider providing the correct filters. Thw Villa was very welcoming and clean. Very spacious and we really enjoyed the basketball and foosball in the garage. The rooms were spacious and the beds were very comfortable. The home was immaculate and the location was convenient. It felt secluded yet close to everything we wanted to do. We enjoyed spending time on the back deck. We had 4 singles traveling and both full baths were in an ensuite arrangement, so it was a bit awkard for those who didn't have a master with attached bathroom to go through someone else's bedroom to take shower. Even so, it was spacious and up-to-date and clean and overall we thought a good deal for the price we paid. Hello, Darlene! Thank you for giving us your feedback. We apologize for the confusion about the bathroom layouts, but we're glad to hear you had a nice stay regardless. We hope to see you again, and don't forget to mention your previous stay with us for a returning guest discount! Couldn't have asked for a better place to stay. All the comforts of home. Big enough for the whole family. Clean and comfortable. The property was well kept and close to all entertainment. The pool was very accessible but very small for our family of 25. The driveway entrances were extremely steep and some of our cars bottomed out so we had to park in different driveways than were assigned! The neighborhood was beautiful and all neighbors were very friendly! The property was beautiful and clean. Loved the stay. Close to town but far enough out that you were not in the crazy traffic all the time. Love that there was enough room for the family to hang out together. Everything was great. Two minor kitchen sick was leaking very bad, called manager it was fixed within the hour. There is also a dinning room chair that is broken, so only 5 chairs instead of 6 could be used. Told maintances person about this. When they say 4 Bedroom, make sure to let people know the 4th bedroom in only a pull out sofa in a small room. Hi, Paula! We're glad that you had a great stay at Villa Vista! We really appreciate this feedback you've given us. We hope to see you again in the future, and be sure to mention your previous stay with us for a special returning guest discount! Hi, Leticia! 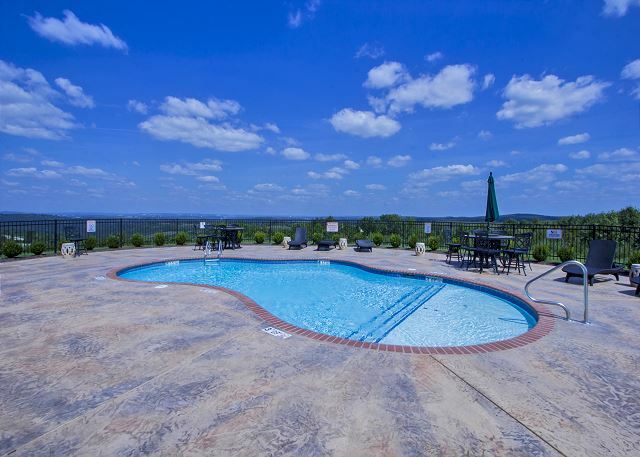 We're glad to see you enjoyed your time at Villa Vista! Your feedback is extremely appreciated. 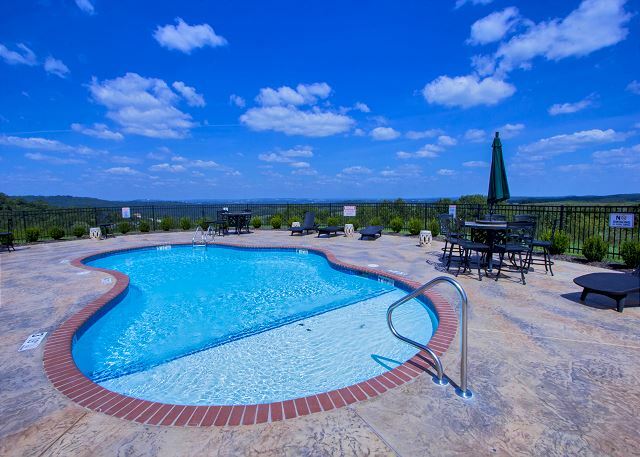 We apologize if the consumables seemed a bit bare, but we can always give you a list of things provided at all our properties which can make planning your perfect Branson vacation even easier! We can't wait to see you again, and next time don't forget to mention your previous stay with us for a special returning guest discount! The condo was nice and comforted. Very cute area. Close to the airport for anyone fluting in lustre. This place was WONDERFUL!!! Our girls each took a friend and they were blown away!! Very clean, great furnishings, awesome bed!! We would LOVE to stay there again! Nice place,a few miles away from the hustle of the strip. The condo is nice and new. Great space we had 6 adults and 1 child plenty of room.